Presto Panini is a comfortably relaxed cafe that has been happily running since 1988. Presto calls itself a cafe and I guess it is one – but it seems more like a teeny tiny restaurant with seating for about 30 at adorable little tables draped in red and white checkered tablecloths. Whether you’re picking up some takeout or having a sit down meal; the waitresses and kitchen staff are fast and friendly. Presto is perfect for a weekday lunch or a casual early dinner. I’ve been there twice and tried both the panini and the pasta. Both are very worth the price – the paninis are $10 they are huge and come with a tasty side of mixed greens and vinaigrette. The pasta prices range $11-14 and masquerade as small portions at first – but don’t be fooled – the quality of the ingredients is so good you’ll be full before you polish off that last delicious bite. On my first visit I had the pleasure of devouring the lovely gnocchi with gorgonzola and cream. This was maybe a bad choice for a lunch on a workday because it was so heavy and rich with dairy. The gnocchi (potato flour dumplings) were delicately soft and delightfully filling. And the gorgonzola was front and center – my dinning companion remarked that the dish was “too cheesy” ; however, the phrase too cheesy is never one that I apply to food, only to people. I was satisfied with the deliciousness of my meal. The second time around I went all out and tried the Penne with italian sausage and tomato, the prosciutto asparagus panini, and the tiramisu. Yeah – I’m still full and tired 3 hours later. The penne (pictured above) was lovely. 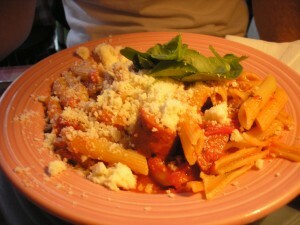 The al dente penne is covered with tomato marinara and fresh parmesan with huge chunks of sausage throughout. Though the sauce was considered a tomato marinara – it wasn’t some flavorless slop outta a can – it was a perfect balance of tasty fresh tomato without being too acidic and just the right spices. The panini was bigger than I could manage (you can’t really see in the photo – but what’s being held open is only half of the sandwich – and nestled between the halves is a virtual mountain of mixed greens). The panini came piled high with prosciutto – not the greatest quality of Italian ham I’ve ever had but it was still good and there was tons of it! 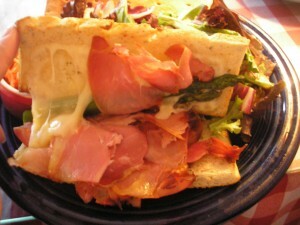 To the delight of my tastbuds the panini was overflowing with a ridiculous amount of mouthwatering mozzarella. There was also a little asparagus in the panini – I wish there would have been more of the perfectly cooked spears – but no sandwich is perfect. Ooooh yeah – I could barely contain myself long enough to take a decent photo before diving in. 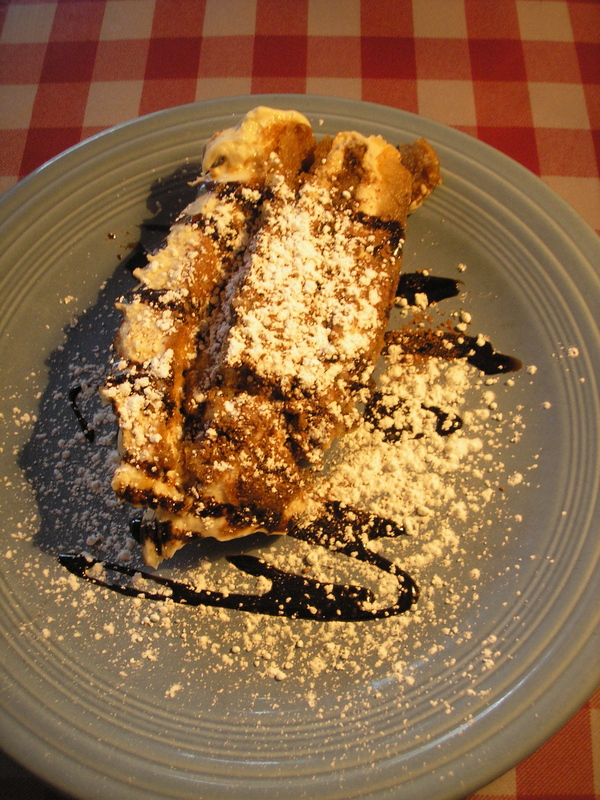 The tiramisu at Presto is lovely – it has it all – the cocoa, the mascarpone, the espresso, the powdered sugar – and no hint of cinnamon (which has become a popular, but unpleasant, addition to the North American version of the recipe). Though we went with the meaty side of things with our meals there are LOTS of veggie options. Pastas with pesto, tomato, or cream. There is also a decent selection of veggie paninis (eggplant, avocado, asparagus, artichoke). and there are also some soups (including the tasty sounding ginger coconut) and salads available. Bonus: plenty of Italian beverages including wines available. Bonus part II: The bathroom decor. The entire bathroom (floor to ceiling) is covered in Italian opera posters…except for the bit next to the door – where they must have run out of opera posters and decided to fill the space with random movie posters (like Million Dollar Baby and Whoopi Goldberg’s latest flick). What does MJ have to do with paninis? Okay, nothing -but MJ just bought the farm. I looooved his infectious superpop and his awesomely bold fashion choices. Thriller is the best selling album of all time for a reason; it’s got it all: funk, disco, soul, rock, R&B and pop Pop POP! Nine top ten singles and eight grammys came outta Thriller. Bad – In terms of popularity, Bad was nothing compared to Thriller — but Bad did have five no.1 singles and won two grammy. Plus, I love Wesley Snipes as the bad influence friend in the short film for Bad. 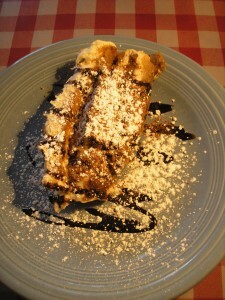 This entry was posted in Food, Music, Restaurant Reviews and tagged cafe, downtown, hornby, italian, panini, pasta, robson, Vancouver. Bookmark the permalink.